Thompsons is passionate about law reform in order to help individuals who have been victims of accidents that were not their fault. As the largest personal injury firm in Scotland, this will always be one of our main concerns, and we have fought hard to change the law whenever we feel it unfairly treats our clients. Unfortunately, we find the justice system neglects personal injury victims all too often, and sometimes legislation changes take matters in the wrong direction, undoing the campaigning work that Thompsons Solicitors and many others, including trade unions, have been involved in. The civil justice reforms recommended by Lord Gill are a prominent example of this. In 2007, Cathy Jamieson, who at the time was Minister for Justice, asked Lord Gill, one of Scotland's most senior judges, to review the civil courts system in Scotland. The review would go on to last two years, with the final report released in 2009. The reforms mentioned in the report were intended to make the system more effective, efficient, and affordable, but it drew criticism from many and it was felt that "major stakeholders in the civil justice system, such as trade unions, were barely mentioned in the review. Unions raised concerns that the changes would benefit the insurance companies more than the victims of personal injury. There were grave concerns that the review would set back decades of hard fought advances in Civil and Health & Safety Rights. The report eventually led to the Courts Reform (Scotland) Act 2014, which took on many of Gill's suggestions. One of the key recommendations taken forward was that cases with a value of up to £150,000 would be heard at the Sheriff Courts rather than the Court of Session. The threshold had previously been only £5,000, meaning many of the cases that would originally have gone to the Court of Session were relegated to the lower Sheriff Courts. This threshold was later reduced to £100,000 in September 2015. We would not have got very far as a personal injury firm if we did not believe in several key principles. These are what we think of as the cornerstones of a fair and equitable civil justice system. This is a very brief summary of the important issues that we felt were potentially being compromised by the reforms. Civil justice is not a commodity consumed by Court users. It is there to maintain fairness among society and help those who have been unjustly treated. It is our basic human right that the state shall provide all of its citizens equal access to its Civil Courts to resolve its disputes, and, therefore, the Civil Justice system should not be privatised any more than our hospitals or schools should be privatised. Justice should never be based on who has the largest pockets, which is what would happen if the Courts are fully privatised. It should be based on who has the strongest case. The victims and their families should be at the heart of the Civil Justice system. And everything possible should be done to ensure health and safety laws are improved so that devastating tragedies, which impact upon victims and their loved ones, are prevented from happening in the future. This is why cases involving the extremely important matter of health and safety deserve to be heard in our highest Courts before our most learned Judges. This will ensure that the law on health and safety remains strong and clear and to also ensure that the justice system gives such cases their appropriate place. Victims of injury and disease in Scotland should have all the same opportunities as victims in other jurisdictions, meaning that they should have exactly the same access to Courts as they do in England and Wales and the same opportunity to recover legal fees. The compensation lawyers at Thompsons are always on your side, even when the law isn't. We will do everything in our power to give the victims of negligence and their families the maximum amount of compensation possible. And you can be assured that we will challenge the law whenever it tries to do otherwise. Approachable, dedicated, and experienced, our solicitors will be able to offer all the necessary guidance about making a successful claim. We only ever represent victims, never taking the side of big businesses, so we have a firm understanding of just how much sustaining a personal injury can impact upon a family. 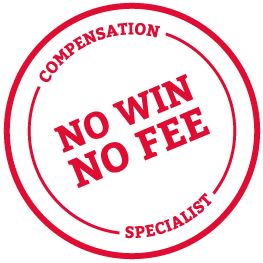 We always try to keep our fees to a minimum, offering a No Win No Fee Solicitors package on many cases to help settle any fears of incurring unnecessarily high legal costs. For the best chance of making a successful claim for compensation, contact Thompsons today on 0800 0891 331 and discuss your case with one of our specialist lawyers.